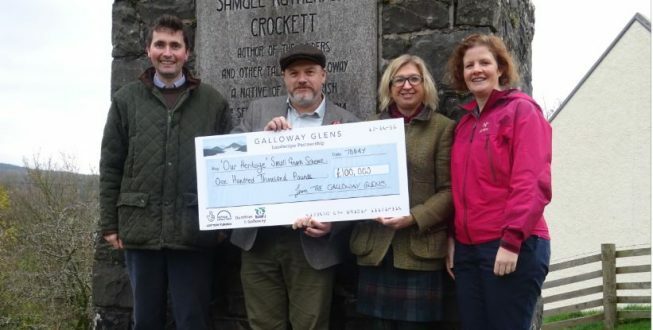 The Galloway Glens Landscape Partnership (GGLP) is delighted to announce the launch of the ‘Our Heritage’ Small Grants Scheme, with £100,000 in total earmarked to be awarded over the next five years. The GGLP is inviting applications that support efforts to ‘connect people to their heritage’ and link with the wider vision of the GGLP and principles of the Galloway & Southern Ayrshire UNESCO Biosphere. The maximum size of award is £5,000, with applications open to any not-for-profit organisation. Full details and deadlines, together with guidance on how to kick off an application, are available on our website HERE, with the first deadline for submissions being the 7th January 2019. The launch this week of the ‘Our Heritage’ Small Grants Scheme is timed to align with an exciting update to our website which includes more information about how our headline projects are progressing as well as guidance on the Small Grants Scheme itself. If you are interested in applying, please have a look at our website and contact me if you have any queries with respect to a potential application. The ‘Our Heritage’ Small Grants Scheme forms part of the GGLP, a Heritage Lottery Fund supported initiative taking place over the next five years and supporting a range of 35 lead projects up and down the Ken/Dee valley, from Carsphairn to Kirkcudbright. These projects vary massively in individual focus, from path improvements to canoe trails, from building refurbishments to marketing campaigns, and from job training schemes to visitor attractions. All the projects are linked in some way so that together they increase our understanding of and access to this unique and special landscape. We are extremely fortunate to have been able to ringfence £100,000 from the Heritage Lottery Fund award towards the Small Grants Scheme, allowing us to to support further opportunities that don’t form one of our headline projects. It is open to any application that ties in with our grassroots aims that will together provide a sustainable and prosperous legacy for the community as a whole. We look forward to seeing applications come forward and my thanks as always go to the Heritage Lottery Fund and our other partners for their generous support in making this possible.